Washington, D.C., is the con- tracting activity (N00024-82-C- 2234). Jacksonville, Fla., by Michael C.
Kenney, president of the com- pany that supplies provisions, deck, and engine equipment to vessels and industrial plants. Mr. Castelvecchi, who was as- sociated with North Florida Ship- yards as purchasing agent before joining Ships Supply, will recom- mend policy and assist in devel- oping and administering policy on matters concerning corporate purchasing. The new corporate purchasing agent will have control of an in- ventory numbering thousands of items that include anchors to engine parts to food supplies. Ships Supply also maintains an office and warehouse in Tampa. Write 722 on Reader Service Card • into one business unit the engi- neering, management, and lab- oratory resources necessary to support all of the division's acoustic sensor design and small- quantity manufacturing activi- ties. By concentrating these capa- bilities under one head, the new organization is designed to more efficiently meet projected future requirements for underwater acoustic equipment. The new Honeywell group fits within the company's Seattle- based Marine Systems Division (MSD), a leader in naval acoustic equipment and ocean engineer- ing services. Since 1951, MSD has developed and produced a wide spectrum of underwater sensor products for both government and commercial applications in the United States and abroad. Commercial products generally related to acoustic positioning systems such as beacons, trans- ponders, and the corresponding shipboard equipment also are produced. Head of the specialized under- sea sensor team is Robert D.
Save 10% to 30% on fuel costs. 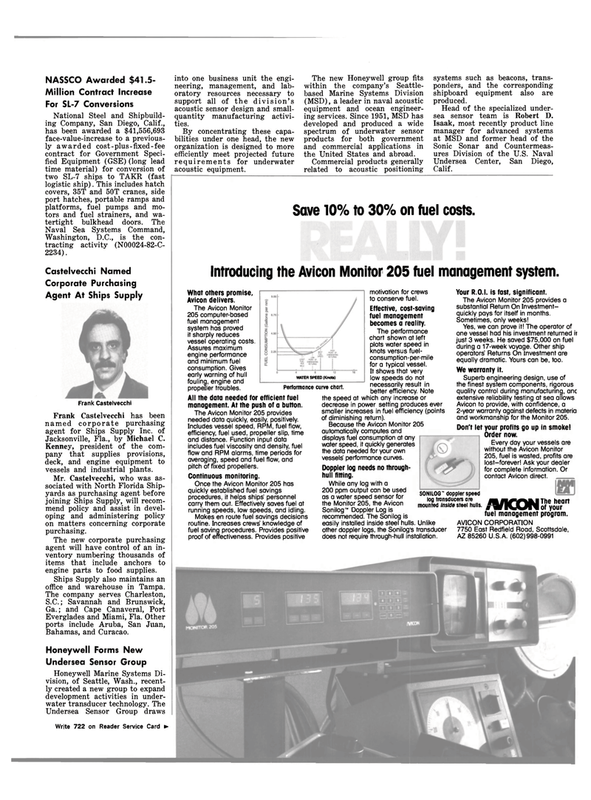 Introducing the Avicon Monitor 205 fuel management system. The Avicon Monitor 205 computer-based fuel management system has proved it sharply reduces vessel operating costs. WATER SPEED (Knots) propeller troubles. All the data needed for efficient fuel management. At the push of a button. The Avicon Monitor 205 provides needed data quickly, easily, positively. Includes vessel speed, RPM, fuel flow, efficiency, fuel used, propeller slip, time and distance. Function input data includes fuel viscosity and density, fuel flow and RPM alarms, time periods for averaging, speed and fuel flow, and pitch of fixed propellers. Once the Avicon Monitor 205 has quickly established fuel savings procedures, it helps ships' personnel carry them out. Effectively saves fuel at running speeds, low speeds, and idling. Performance curve chart. motivation for crews to conserve fuel. Effective, cost-saving fuel management becomes a reality. The performance chart shown at left plots water speed in knots versus fuel- consumption-per-mile for a typical vessel. It shows that very low speeds do not necessarily result in better efficiency. Note the speed at which any increase or decrease in power setting produces ever smaller increases in fuel efficiency (points of diminishing return). Because the Avicon Monitor 205 automatically computes and displays fuel consumption at any water speed, it quickly generates the data needed for your own vessels' performance curves. Doppler log needs no through- hull fitting. Sonilog™ Doppler Log is recommended. The Sonilog is easily installed inside steel hulls. Unlike other doppler logs, the Sonilog's transducer does not require through-hull installation. Your R.0.1. is fast, significant. The Avicon Monitor 205 provides a substantial Return On Investment- quickly pays for itself in months. Yes, we can prove it! The operator of one vessel had his investment returned it just 3 weeks. He saved $75,000 on fuel during a 17-week voyage. Other ship operators' Returns On investment are equally dramatic. Yours can be, too. Avicon to provide, with confidence, a 2-year warranty against defects in materia and workmanship for the Monitor 205. Don't let your profits go up in smoke! Every day your vessels are without the Avicon Monitor 205, fuel is wasted, profits are lost-forever! Ask your dealer for complete information. Or contact Avicon direct. SONILOG" doppler speed log transducers are mounted inside steel hulls. jMJlfWdThe heart m WIVVI1 of your fuel management program.